Bruce Springsteen delivered a 3-hour set, featuring hits from throughout his entire career, on November 17th. The sold out Sprint Center, in Kansas City, was in the palm of his hand all throughout the performance. The crowd was one of the loudest and most frenzied I have ever heard. The show felt like one continuous set of highlights. The Boss took the stage around 8:20pm, playing a version of the standard “Kansas City.” A rocking version of “She’s the One” Since the passing of the E-Street Band’s saxophonist, Clarence Clemons, the band has expanded to include a full horn section and backup vocalists. 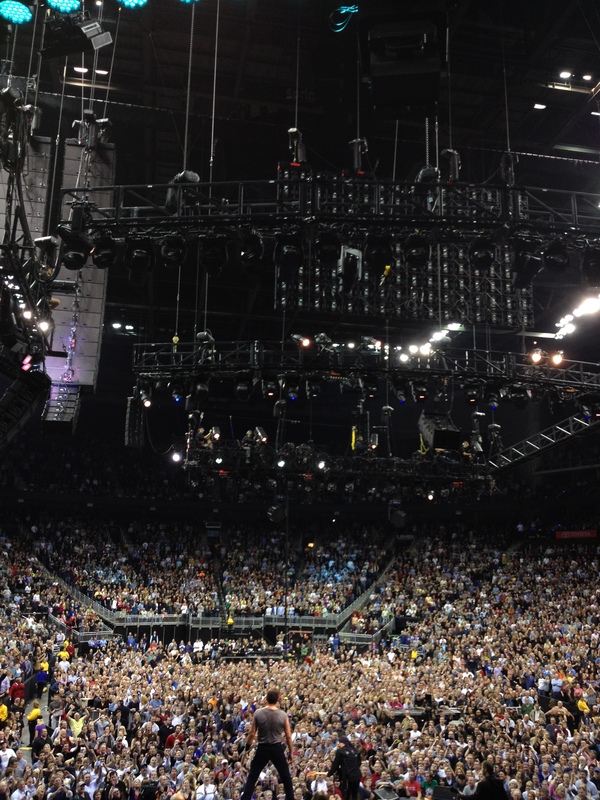 There are now 15 people onstage backing up Springsteen. The fleshed-out band helped to add more body and musical depth to the songs. “Hungry Heart” caused a sing-a-long from the massive crowd. The title track from Springsteen’s latest album, “Wrecking Ball,” began on acoustic guitar, then grew to include the whole band. Springsteen introduced “My City of Ruins” by discussing Hurricane Sandy and it’s devastating impact on the East Coast. It added a newfound weight to the song. Bruce Springsteen’s songs and lyrics have a timeless quality and continue to inspire people to overcome hardship. Fans brought in signs requesting songs that wanted to hear. Bruce went out into the crowd, grabbed a sign reading 57. The band then launched into the rarely-played “Incident on 57th Street.” Moments like this show how Springsteen and the E-Street Band truly caters to their fans. “Because the Night” and “Cover Me” back-to-back had the crowd rocking. A soulful, yearning version of “I’m on Fire,” and a spirited, gospel-tinged version of new song “Shackled and Drawn,” balanced out some of the sprawling rock songs. During “Waiting on a Sunny Day,” Spngsteen had a little girl in the crowd sing the chorus. “Scarred for life,” he joked after finishing the song. “Land of Hope and Dreams” was extended in a lengthy jam. Bruce dedicated the rarely played “My Beautiful Reward,” to his cousin, Lenny. Springsteen canceled his 2009 Kansas City concert after his cousin died of a drug overdose. “Born to Run” was swaggering and anthemic. During “Dancing in the Dark,” the band pulled women from the crowd to dance with them. Much comical and terrible dancing ensued. Springsteen broke out a Santa hat, and the band did a cover of “Santa Claus is Comin’ to Town.” This cover also maintains a special connection to Kansas City. Springsteen’s version of the holiday classic, recorded at Kemper Arena in 1984, is still played during the holidays on local radio stations. For the finale, Springsteen jumped on top of the piano as the band jammed. The jam shifted into “Tenth Avenue Freeze-out.” The song served as a moving tribute to Clemons.